Let's suppose we have our own calculation that assigns numbers to every atom as a result, plus some molecular values or other information we would like to display with MarvinSpace. create our own Popup menu with actions. We have a molecule and values for each atom of the molecule. Let MarvinSpace install the necessary native libraries. We will use the MSpaceEasyclass to easily configure MarvinSpace. First, we need 1 row and 2 columns. Create the frame that contains the MarvinSpace canvas. We would like synchronous control of the cells. 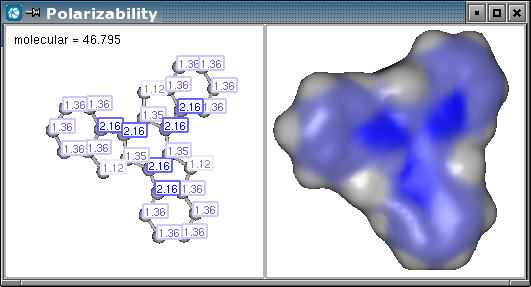 We put the molecule to the first cell and create labels from the result values. 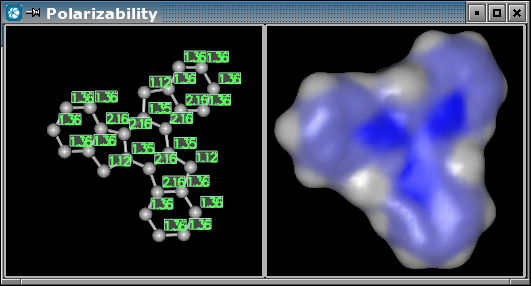 Then put the same molecule to the second cell, and have its Connolly surface calculated. We are finished with the first step, the result can be seen on the image. 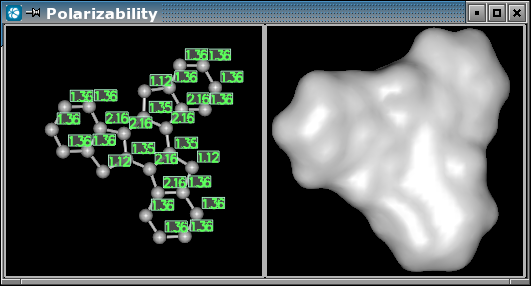 We should keep the component that represents the molecular surface. We choose our own colors to color the molecular surface. In this example we would like to color areas that correspond to values near to zero with gray, and areas that correspond to higher values with blue. We also choose a color between gray and blue as a breakpoint in the homogenous color flow, so that we can distinguish higher values from lesser values. Say we have the value range 0 - 2.16. With two colors it is a simple linear coloring. But with adding an extra color that hardly differs from gray results in a range of colors mainly between 1.08 and 2.16. We can pass the atomic values and have the surface colored by them according to the previously set colors. Although we might want certain labels to have individual settings, just as the upper left label in our example. In this case property settings can be disabled. We should keep the labels that were created to each atom. The following property setting is unnecessary, because it would take effect just after we set the color to each label, so we put this in comment. We can color each label to the same color that is the color of the atom on the molecular surface. To do so, we get the color palette from the surface, and we can get the color to each atom.